The sea lamprey is an incredibly destructive invasive species. Since entering Lake Ontario in the mid-1800s, and the upper Great Lakes beginning in 1921, sea lampreys have inflicted significant economic damage, harmed the fishery and ecosystem, and changed the way of life in the region. Of the more than 180 non-native species in the Great Lakes basin, sea lampreys are the only invader that is controlled basin-wide and is the only example in the world of a successful aquatic vertebrate pest control program at an ecosystem scale. Sea lampreys must be controlled to maintain and improve the fishery as we know it and to protect the integrity of the ecosystem. The good news is they can be controlled! The Great Lakes Fishery Commission, pursuant to the Convention on Great Lakes Fisheries, delivers sea lamprey control in partnership with the U.S. Fish and Wildlife Service, Fisheries and Oceans Canada, and the U.S. Army Corps of Engineers. The U.S. Geological Survey conducts critical sea lamprey research to aid in control. This control program has reduced sea lamprey populations by 90% in most areas of the Great Lakes, a remarkable success! How are sea lampreys controlled? Sea lampreys spend a significant portion of their lives in tributaries as filter feeding larvae, so sea lamprey control begins when biologists assess tributaries to determine which ones contain larval sea lampreys. Larval assessment is critical in determining the presence, distribution, size structure, and abundance of larval sea lampreys in infested tributaries. This information helps the commission decide where and when control should be implemented. Sea lamprey control works because the commission has several tools available to significantly knock-down the populations. The primary method to control sea lampreys is the application of the lampricide TFM to target sea lamprey larvae in their nursery tributaries. 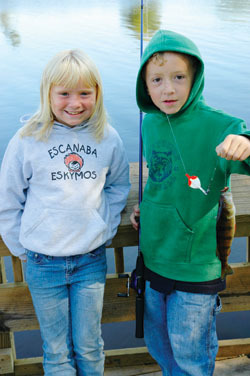 In the concentrations used, TFM kills larvae before they develop lethal mouths and migrate to the lakes to feed on fish, while most other organisms are unaffected by TFM. TFM disrupts energy metabolism in sea lampreys, which have low levels of the enzymes used to eliminate TFM from their bodies. Another compound called Bayluscide is less costly and during some treatments, a liquid or powdered form of Bayluscide is combined with TFM to reduce the amount of TFM needed during treatments. Additionally, a granular form of Bayluscide, consisting of Bayluscide-coated grains of sand covered with a time-release coating, is applied to slow-moving or stationary waters where it sinks to the bottom before releasing its payload. This enables control of larvae in areas where TFM cannot be used. 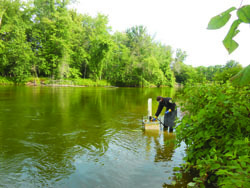 About 200 Great Lakes tributaries and larval "hot spots" are regularly treated with lampricides to kill larvae before they have a chance to prey on fish. To successfully reproduce, sea lampreys require access to tributaries containing spawning gravel and soft substrates for larval sea lampreys to burrow into. The jumping ability of adult sea lampreys is limited, so barriers function to block adult access to spawning habitat and, therefore, reduce the amount of habitat that sea lampreys can infest. 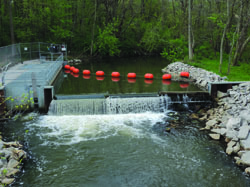 In addition to power generating and other dams, low-head barriers specifically designed to block adults have been constructed in strategic locations around the Great Lakes. 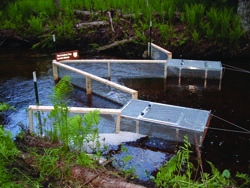 Most low-head barriers allow jumping fish to pass while other barriers incorporate "trap and sort" fishways, which permit the passage of non-jumping species (trapped sea lampreys are removed). Barriers have reduced or eliminated the need for lampricide treatments in thousands of miles of tributaries. Sea lampreys are vulnerable to capture as adults when they move into tributaries to spawn or as juveniles when they move out of tributaries to prey on fish. Adult traps are typically built into or placed immediately downstream of sea lamprey barriers and capture up to 40% of the adult population from a tributary. Unfortunately, traps typically do not capture a high enough proportion of the adult population to eliminate reproduction entirely or the subsequent need for lampricide treatments. Nevertheless, trapping provides a critical way to assess adult populations and gauge the success of the sea lamprey control program. Juvenile traps are typically free-standing, removable nets or other devices that target sea lampreys before they kill fish. Sea lampreys have an extremely keen sense of smell, and since the 1990s, the commission and its research partners have been developing ways to exploit that sense for sea lamprey control. Pheromones and alarm cues are natural odors organisms use to affect certain behaviors or physiological functions. Sea lampreys emit pheromones to attract adults to suitable spawning tributaries and to mates within the tributary. Alarm cues emanate from dead or injured sea lampreys and warn other sea lampreys of impending danger, causing a flight response. Together, pheromones and alarm cues could be used in a "push-pull" technique—luring adults to traps, unsuitable spawning habitat, and areas that are easy and inexpensive to treat with lampricides, and repelling them from areas with productive spawning habitat and areas where control tactics are hard or expensive to implement. The fishery depends on sea lamprey control. Fish are part of the fabric of the Great Lakes. The Great Lakes fishery is worth more than $7 billion annually. The fishery supports 75,000 jobs, in addition to hundreds of thousands of jobs related to tourism, navigation, etc. More than 5 million people fish the Great Lakes annually. Commercial fishing is the backbone of many Great Lakes communities. Charter fishing is an important business. Subsistence fishing is a right and a way of life for tribal and aboriginal communities. Sea lamprey populations have been reduced to a fraction of what they were before control began, creating conditions for the recovery of native and desirable fishes and the ecosystem. Today, agencies stock hundreds of millions of trout and salmon into the lakes, enhancing the resource. Sea lamprey control must continue. Sea lamprey control is a major contributor to the value of the Great Lakes fishery. Sea lampreys are resilient beasts. When control is relaxed for even a short time, they bounce back with a vengeance and inflict major harm. Elevated sea lamprey abundances take years to remedy and higher populations set back fishery and ecosystem recovery by decades. Robust, ongoing control is essential. More sea lampreys mean a degraded ecosystem, increased damage to the fish community, and fewer fish. The people who depend on the $7 billion fishery suffer economically when sea lampreys prey on Great Lakes fish. Waterfront communities decay and people move away. More sea lampreys jeopardize tribal treaty obligations.